The iPhone camera HDR mode takes great pictures, there’s no doubt about that. 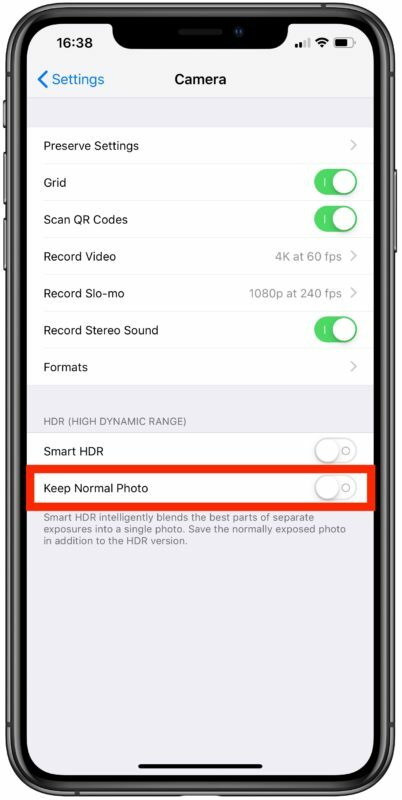 What might not be so great for some iPhone users is that when you have HDR mode enabled, the iPhone will store two versions of all photos you take into Camera Roll in Photos app, which at 5+ megapixels a pop can quickly consume an iPhones available storage. For some situations, the two photos look so similar that they just look like duplicates, whereas other times either the HDR version or the non-HDR version looks better. Being able to compare the two versions of the photos side by side is undeniably helpful, but if you’re concerned about storage you may want to change this setting so that two pictures aren’t created from a single photo shot with iPhone camera. Stopping iPhone camera from saving two photos of the same picture depends on which iOS version is on the iPhone (or iPad or iPod touch, technically). For iOS versions including iOS 12, iOS 11, iOS 10 and later. This setting exists on all iOS versions with a camera that is HDR capable, yes the settings menu can look slightly different but the effect is the same. From here on out, if you have choose to take an HDR photo, only the HDR exposure will be saved. 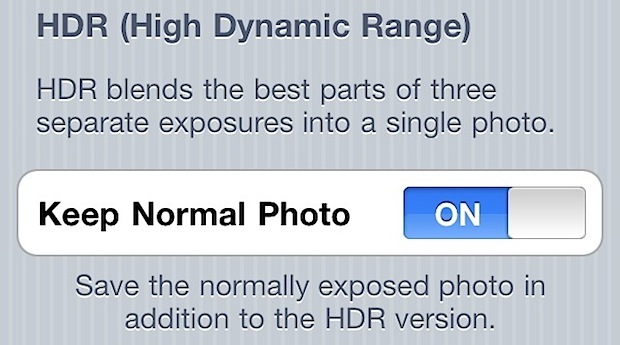 As before, if you aren’t using HDR then the normal picture will still be saved. This makes a lot more sense to some users and sometimes people can be slightly confused why the iPhone is seemingly taking two of the same photos, then storing duplicates. But upon closer inspection you will see that the two photos are actually different, and often the HDR version will include more details particularly in challenging lighting situations. Nonetheless that is not always the case, so for some users keeping the “Keep Normal Photo” turned ON is valuable, particularly if you use iPhone as a primary camera or want the best possible options when working with your photos, since you can manually compare the HDR vs non-HDR version of the same photo. Disabling this feature prevents duplicate image storage and will save you a lot of storage space over time. If you take a lot of photos this can be helpful to you for that reason, particularly if you use iCloud Photos, though iClouds free 5GB plan won’t be holding much data so the higher tier plans may be necessary. Be careful if turning off the saving of two photos. Since there is a delay between the capturing of the two images used to create the HDR photo if there is movement the HDR image can come out poor to unusable whereas the non-HDR image is fine. If you turned off the saving of both photos you would never be able to get to the usable image. “iPhone’s HDR mode takes great pictures, there’s no doubt about that.” That’s an overstatement, as HDR is an algorithmic way to blend in multiple images at different exposure settings, there are definitely times where it doesn’t blend in right. I personally experienced that there are more times in low-light condition where HDR would introduce artifacts like “ghosting” and losing sharp edge details than what HDR is good at: expose correctly in partial area of the photo. So leaving an normally exposed photo would at least give you a change to see and compare. Oh yeah, since 3 images are blended in, HDR is about 1.5x-3x bigger than the normal one. Plus what Tinman says is true. Using HDR means you have to hold it a bit longer for iPhone to shoot 3 images – when that’s a slower shutter speed in low-condition, you odds of smearing the photo / ghosting due to premature movement is pretty high! The comments on this were awesome. I hadn’t done any research into how the HDR worked and, like the poster’s target audience, thought the “duplicates” were just that. Glad I read the comments. I’ll just have to browse through all those HDR vs not photos! Totally agree with the comments above. If you shoot in RAW (TIF) and keep the original component files you have the opportunity to edit then in LightRoom or PS and re-blend to HDR. Not always necessary for average shots; but when the mobile gets it wrong it seems a bit silly to have thrown away your “negatives”. The only downside is that you need to do some housekeeping from time to time.